There was a time when even the very best trekking poles were deemed either too heavy or unnecessary for an outdoor adventure but thankfully this is no longer the case. Modern designs and alternative concepts mean there is now a huge variety of practical walking sticks for hiking, while recent scientific studies have also proven the specific advantages of having one in the first place. Even if trekking is not something you do on a regular basis, the above mentioned studies outline how the best hiking poles will increase comfort on difficult terrain while also reducing the amount of stress inflicted on your body. In fact, trekking pole reviews are testament to these advantages and the only real question in this sense is not really whether you should have one but rather which is the best option for you. Whether trekking is a part-time activity or a passion, Montem Ultra Strong trekking poles are leading the way when it comes to customer reviews. Furthermore, when you consider an all-purpose set of trekking poles, Montem Ultra Strong are likely the best starter option which cover all bases. Strong and versatile, the aluminum base ensures each pole is entirely suited to both short and more arduous trekking while adjustable bolts make it convenient to alter length according to any changing terrain. Trekking poles are designed to make trekking easier, or at least more comfortable, and that is most certainly what the Montem Ultra Strong trekking poles will do, but it must also be noted that these are not merely a “standard” product. Montem have also focused on detail to introduce one of the very best hiking poles to the market. Comfortable nylon straps allow you to carry them with as much comfort as possible and at just 9.6 ounces per pole, they are also ultralight. Another highlight is in how they have managed to scale this down to an extremely compact 24” which makes them extremely convenient in terms of packing. In this sense the Montem Ultra Strong Hiking poles are ideal for the intrepid traveler or part-time adventurer, but as mentioned above, these poles are an extremely strong and reliable option which can assist even the most experienced trekkers in challenging conditions. Flexible, compact and durable; Montem has certainly produced one of the best hiking poles to reach the market in recent times. For one reason or another, you may have your heart set on carbon fiber and in such a case, Montem has also produced one of the best carbon fiber walking sticks. Consisting of 100% carbon, these are ever lighter than the aluminum model with a number of special features which more than merit the monetary value attached to them. As mentioned, the poles are 100% carbon fiber and not a mix of carbon and aluminum, which you will often encounter. This makes each carbon fiber pole a mere 7.6 ounces and eliminates any issue surrounding weight in the process. Carbon fiber also has the natural ability to counter any sudden vibrations, but the extremely lightweight factor is undoubtedly the main feature. As with the aluminum option, the carbon fiber trekking poles also have adjustable bolts which make it easy in terms of adjusting length on the go. This is often necessary on uneven or mountainous terrain as the ease at which you can change the length of these poles make this feature truly worthwhile. And then there are also the nylon straps which allow for more comfort and the foam handle which extends down the pole. Although they may not be as strong as the aluminum poles, these Montem Ultralight trekking poles are still extremely strong and designed to last. They feel solid to grip and the extended handle allows for room to maneuver your grip. Steel tips or rubber tips, there are ways to tweak the performance and despite their lightweight nature, the Montem Ultra-Light Carbon fiber trekking poles are durable and excellent value. Many manufacturers are now focusing on niche products and an example of these are women’s trekking poles. Black Diamond Distance Z Z-Poles are often the recipients of excellent feedback on pole trekking reviews and with so much thought and consideration having gone into this product, it’s easy to see why. Although aluminum based, the poles are lightweight and can be folded and reduced to an extremely small size, making them easy to carry and pack. 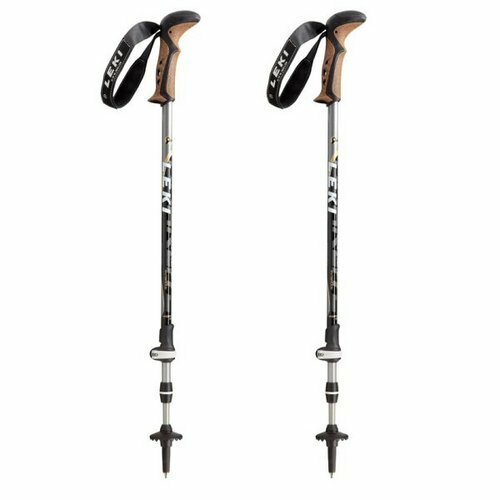 Sturdy and versatile, the poles are well suited for both day hikers and more experienced trails, while the speed at which they can be adjusted or folded is certainly one of the most impressive features. And then there are the wrist straps, which specifically cater to either the left or right hand; the material for these in particular is light and breathable which reduces the risk of pinching your wrist and the rubber grip is adjustable, allowing you to adjust according to the terrain. 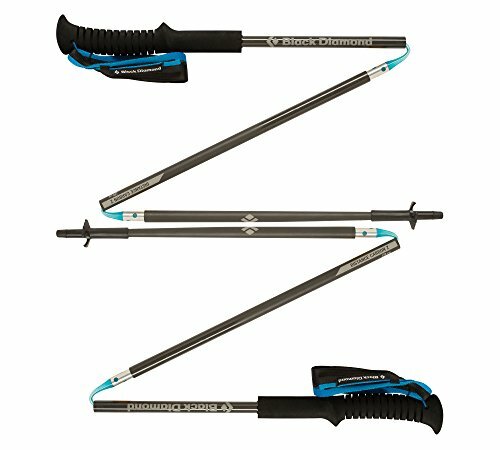 Including a stopper basket and carbide tips, the Black Diamond Distance Z Z-Poles are an ideal option for collapsible trekking poles which are suited to both up and downhill trekking. Extremely light and sturdy, it is easy to see why they perform so well in terms of reviews and given that they pass all international regulations, they are often the best trekking poles for people who travel often. 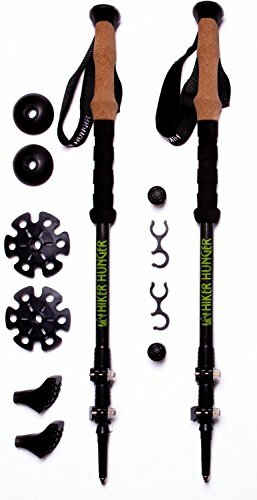 Another manufacturer who provides 100% carbon fiber trekking poles and despite their lightweight nature, the Hiker Hunger is a sturdy pole with ample benefits. Many online reviews will remark how the solid flip locks on these poles never slip, meaning they do not have to be re-adjusted during a trek but then the same can be said about the tungsten tips which hold their grip every time, making a trek so much more comfortable. In fact, everything about this ultra-light trekking pole is convenient and comfortable. The cork grip is accompanied by EVA foam grip extensions, should you wish to use them; these can be very handy on steep descents when choke-ups are more common. Another highlight of the Hiker Hunger Carbon Fiber poles is the quick lock mechanism which allows for them to collapse or extend. Not only does this mean they can be adjusted easily, but it also makes them easy to collapse and store in your backpack. Built for serious trekkers and part time adventurers alike, the Hiker Hunger poles are designed to last while still being one of the lightest poles on the market. Easily adjusted, comfortable and folding to a very compact size, this should be seriously considered as a carbon fiber option for use in a variety of environments. Don’t let the unassuming name put you off, Leki Corklite is a leader in the pole trekking industry. Though similar to the original “Corklite” model, these poles now include an anti-shock mechanism and even though they are not as lightweight as other options, they are often the best choice. The SAS Antishock is a standout feature which has been proven to greatly reduce the impact of any vib﻿rations but there are also several more unique reasons for why Leki Corklite is so popular. Take the grip for example; it does not have a lower grip like many other trekking poles but the Aergon Cor-tec Grips on the upper part of the pole are more than adequate and the speed lock mechanism makes them quick to assemble or change at any time. As mentioned, they are slightly heavier, at 8.75 ounces per pole, but then this also allows for sturdiness and a pole which will last in even the most adverse conditions. When you consider the tough build of these particular poles, it is certainly worth the extra few ounces. Leki Corklite is neither an ultra-light trekking pole nor a basic standard option, but rather an in-between which offers the best of both worlds. For the sake of carrying a few extra ounces, you can be sure of sturdy poles which are more than satisfying, and the same can be said about the price. Some of the best hiking poles will be made of aluminum, and although this is the more affordable and most durable material, it is heavier than carbon fiber. In this sense, carbon fiber is popular when it comes to walking sticks for hiking as they require little effort to carry. Now, this may not be an issue for a casual hiker but for long distance adventurers there is certainly a need to weigh up the pros and cons. Yes, carbon fiber will be much easier to take into the outdoors but what if they break under stress in a situation you absolutely cannot do without them? Straps can be a real annoyance when too tight or if they have a flaw in terms of the lining. Make sure they are adjustable, and if possible, that the wrist strap is padded on the inside. Those small and seemingly useless decorations on the bottom of your trekking pole are actually one of the best inventions. During muddy conditions or snow, you can alternate these baskets to provide better traction between the pole and the ground. Protecting the pole from damage while packed away and on the ground itself, a rubber tip is often the small and unassuming detail which can make the best hiking poles outlast any of their rivals. Naturally, if you are taller, then you’re going to need a longer trekking pole. In this regard you should be careful not to choose fixed trekking poles, whose length cannot be adjusted. There are three main types of handle and each of them come with their own advantages. It may not seem like a vital part of the system but honestly, it is one of the most important factors when it comes to picking hiking poles. Rubber - Many of the best hiking poles will have a rubber grip which is ideal for cold conditions as it helps to insulate the hands. Foam - However, rubber is a poor material during hot weather conditions and in such cases you would be better off with a foam grip which absorbs sweat and moisture with ease. Cork – Another hugely popular option, given how it also absorbs moisture and is a natural counter for any strong vibrations. Although they may serve the same general purpose, every trekking pole is different and each one will be more suitable depending on personal preference or intended activity. Some trekking poles have shock absorbers to counter vibrations, others are more focused on being compact and then there is also the ultralight trekking pole, which requires the least amount of effort to carry. When trekking across mountainous or uneven terrain, adjustable trekking poles are ideal, as they allow you to easily shorten the reach of the poles on an ascent and just as importantly, to increase this length again when going back down. As long as they are durable, collapsible trekking poles are often the best choice on account of their compact size. 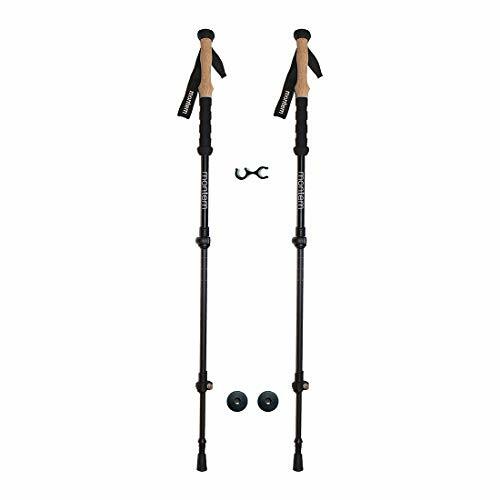 With many manufacturers focused on creating the best version, these are now quite affordable and popular walking sticks for hiking. Most manufacturers are also focusing on niche products within the market and one such niche is with regard to women’s trekking poles. Smaller and often slightly lighter, these are also more suitable to anyone with smaller hands. As mentioned, design has come a long way in recent years and you can now find trekking poles with an built-in spring to counter any unexpected vibrations. This shock absorber can actually be turned on or off when needed but essentially, shock absorbing poles make life a lot easier on the body while trekking. They may now appear as standard, but make no mistake, a set of trekking poles is better than none and even the most basic options are often adequate. Lightweight and low cost, standard poles can be a great option and while they do not have a shock absorber or ability to fold, they still offer great support and a fantastic value. As you will see, there are many options on the market and advanced design has resulted in these trekking poles each offering a superior experience. From lightweight and compact to strong and robust, it’s worth considering which of these features will be genuinely useful and suited to what or where you intend on using them. That being said, if online reviews are anything to go by, then any of the above products should be a solid choice for your trekking needs. And in the event of anything at all going wrong with these poles, all of the above manufacturers offer a dependable warranty which guarantees you get the most from whichever one you decide upon.